Steak lovers rejoice! Grilled Tri-Tip Roast satisfies everyone from the “I like it rare” to the “no pink for me” people all in one cut of beef. This roast has a steak-like texture that makes grilling steak for the whole family a cinch. We’ll show you how easy it is to select, prep, grill and serve this lesser-known cut that brings the wow factor. A local specialty in Santa Maria in the 1950s, tri-tip has continued to grow in popularity with its amazing steak-like texture and flavor. 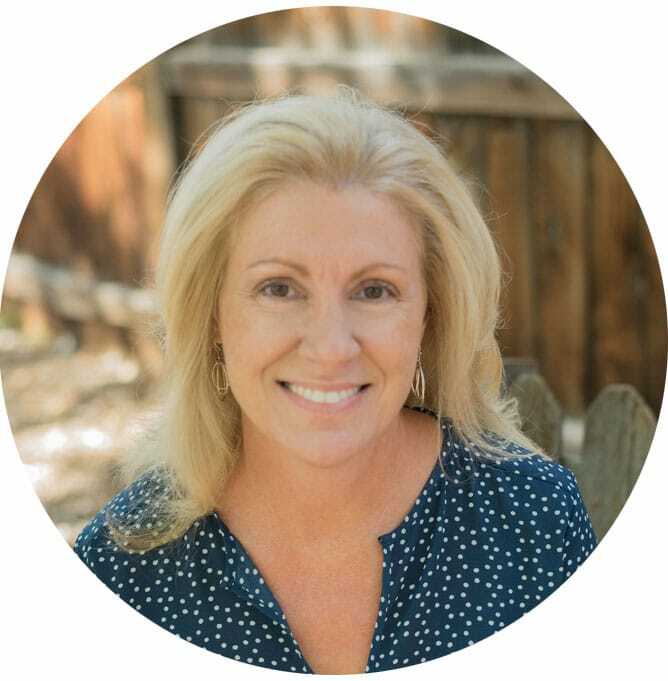 Also known as California cut, Santa Maria roast, Newport steak and triangle steak or roast, it’s routinely sliced for fajitas, grilled as a whole roast or steak, and even replaces ground beef in gourmet chili recipes. 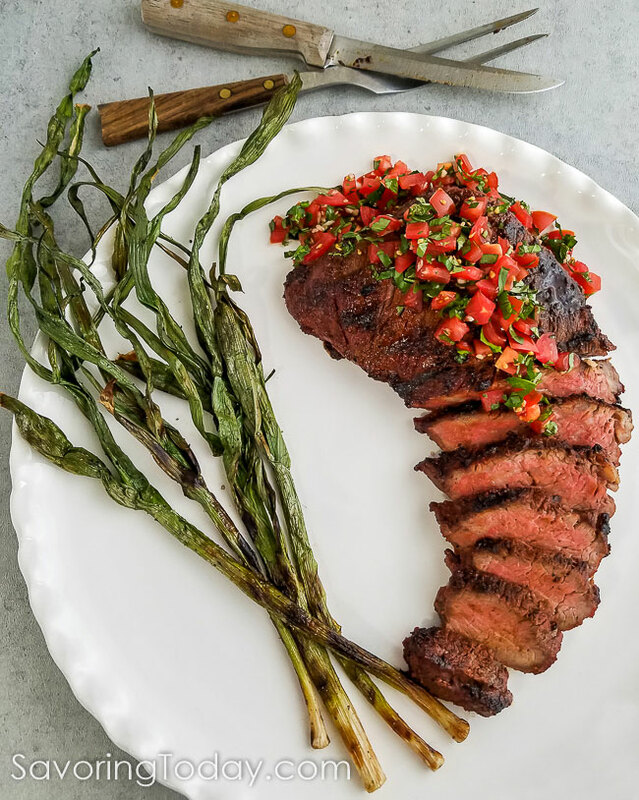 Depending on regional availability, tri-tip can be an economical cut of steak for weekend grilling or entertaining—grilled as a whole roast or sliced into steaks. 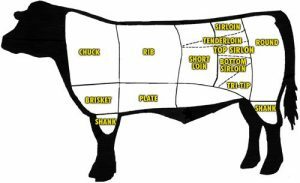 It’s a triangular muscle located on each side of the cow just under the bottom sirloin (this description can help when requesting one from your butcher). If unavailable in your area, U.S. Wellness Meats is a quality source. Tri-tip ranges from very lean (not ideal) to overly fatty (okay, because fat can be trimmed). Look for roasts or steaks with visible streaks of fat running through the meat indicating a well marbled, flavorful cut. If the roast is closely trimmed, you can see the white streaks across the muscle within the grain of the meat. Some roasts are sold untrimmed, which means a fairly thick layer of fat is left on the muscle on one side. If this exterior fat cap is thicker than 1/4 inch, trim to a little less than 1/4″ thick. NOTE: Exterior fat does little to flavor the meat, it is the interior fat marbling the meat that enhances flavor. TIP: Trimming the exterior fat in this way will help minimize flare-ups yet retain enough fat to protect the meat from drying out on the grill. Visit Virtual Weber Bullet to see a trimmed and untrimmed photo. 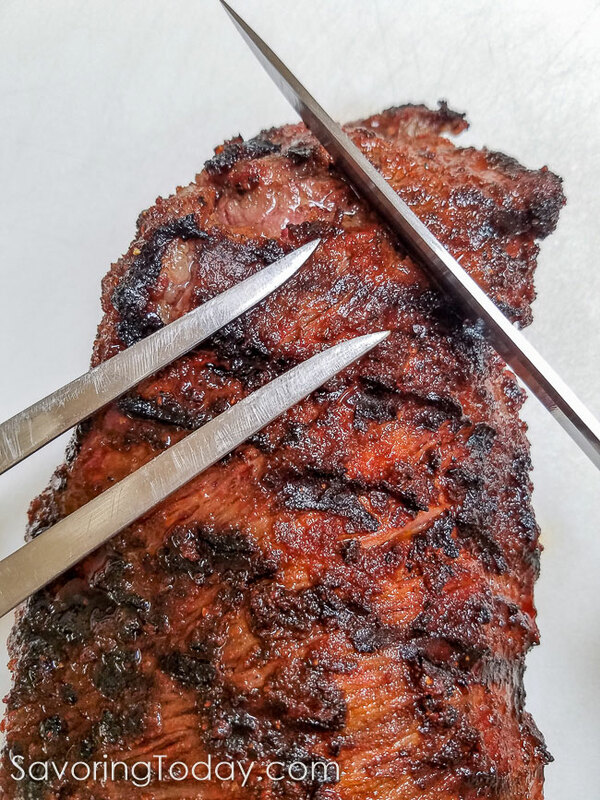 Should you use Marinade, Rubs, or Sauces on Tri-Tip? Yes, however, HOW you use them matters. A marinade is a wet mixture of acid (vinegar, citrus, white wine) or enzymes with aromatics such as garlic, herbs, and a little oil to add specific flavors. These are ideal for imparting citrus or herb flavors that dry rubs can’t match, but work best on thinner cuts since it doesn’t penetrate deeply and the flavor is mostly at the surface. Marinades with acids or enzymes (think papaya or pineapple) should only be on the meat for a couple of hours, otherwise, these ingredients toughen the meat or make it mushy. TIP: Always use a glass dish with an acid-based marinade—aluminum and stainless steel can react with the acid and affect the meat. A dry mixture of salt, pepper, dried herbs, or spices used to add flavor and texture—the seasoning works to form a crust. Salt is the only thing that truly penetrates the meat beyond the surface. Salt needs 40 minutes to penetrate and flavor the meat, so any rubs with salt should be allowed to rest on the meat for at least 40 minutes (up to 24 hours) before grilling. Otherwise, apply just before placing on the grill. TIP: A good rule of thumb is 1 tablespoon of rub per pound of meat, depending on how salty the rub tastes raw. If you taste it straight from the package and you only taste salt, go with a little less. If the salt is pleasant and savory enhancing other flavors, the 1 tablespoon rule works. The flavor and texture of Tri-Tip Roast is more like steak than a traditional Sunday roast so it is best cooked medium-rare. The uneven thickness—thicker in the middle, thinner at the tapered ends—means it will be more done on the ends than in the middle. 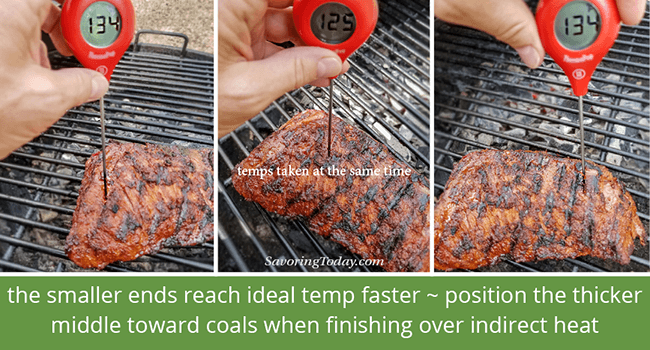 To help the roast cook more evenly, position the thicker part toward the coals with the thinner ends pointing away once it is moved to the indirect heat side to finish cooking. The same roast can be cut into steaks! Yep, just make sure you slice the roast against the grain into steaks at least 1-inch thick. Need some pointers on grilling steaks? Check out this Steak and Shrimp Scampi Recipe post for trusted grilling tips. If you’re grilling without an instant-read thermometer, it’s time to elevate your grilling game and stop guessing about doneness. Great grilling or barbecue relies more on temperature than time. When the thicker, middle portion reaches medium-rare, the thinner ends will be closer to medium. As you can see in the photo below, the temperature of the tapered ends is almost 10 degrees higher than the middle, taken at the same time. There are so many variables, any grilling recipe depending on time alone will always be a shot in the dark. Once the roast has had a chance to rest after grilling, it’s time to slice and serve. In the photo, the fork is positioned in the same direction the long strands of the meat form to easily identify where to position the knife and begin slicing. Cut against the grain and on a slight bias—this shortens the long strands of the muscle making it more tender to chew. TIP: Keep in mind, a tri-tip has three points and the grain may change direction while cutting (each roast is different). Simply turn the roast to keep the knife slicing across the grain. A finishing sauce or condiment not only adds fresh flavor with every bite, it creates an eye-catching contrast to the browned meat when served. In the photo, I have added a simple tomato, garlic and basil garnish, but there are so many ways to complement this dish. Mushroom & Blue Cheese Ragout—Fresh thyme accents the meaty flavor of crimini mushrooms and Blue cheese brings umami to the luxurious sauce. Chimichurri Sauce—A vibrant mix of fresh parsley, vinegar, and spices–very simple and quick to make with a blender, food processor, or mortar and pestle. Tomato-Basil Compound Butter—A compound butter is simple to make yet enhances lean grilled proteins with big flavor. Gremolata—Just as you are easing into a savory, meaty bite, the slightly bitter tang of the gremolata will wake up your senses. Santa Maria Salsa—Unexpected ingredients like celery, dried oregano, and Worcestershire transform ordinary salsa into a delicious barbecue partner. Fresh Basil Pesto—It’s not just for pasta, my friends. It’s like spreading summer on a steak. TIP: When serving a savory condiment or sauce, reduce the amount of seasonings on the meat before grilling so the sauce or condiment doesn’t over do it. Tri-tip roast marinated or dry rubbed and grilled over charcoal or propane to medium-rare and juicy. In a small bowl or using a mortar & pestle, mix the minced garlic, 2 tablespoons lime juice, 1 tablespoon liquid smoke, 2 teaspoons onion powder, 2 teaspoons sea salt, 1 teaspoon paprika and 1 teaspoon pepper to form a paste. Add enough apple juice to make the paste easy to spread. Spread paste evenly over the meat and allow to sit at least 1 hour, longer is better. NOTE: If using a dry rub, apply 1 tablespoon per pound of meat by rubbing into the meat and allow to sit at least 40 minutes before grilling. When ready to grill, heat a gas grill on high until over 400 degrees (10-15 minutes). Once hot (425°F or higher), clean grates with a wire brush. Create two zones of heat by turning one of the burners off on one side while keeping the others on med-high. Light wood briquettes in a charcoal chimney starter and allow to burn until 90% of the coals are glowing and hot (15 minutes). Dump hot coals into one side of the grill, leaving the other side open. Place the grill grate and clean with a wire brush. Start tri-tip fat side up and sear the meat directly over the hot side of the grill for 5-7 minutes. Turn and sear the other side for 5-7 minutes. Move the meat to the cooler side, over indirect heat, and continue to cook for about 15 minutes (turn as needed) until the thickest part is medium rare (130-135ºF). TIP: To help the roast cook more evenly, position the thicker part toward the coals with the thinner ends pointing away once it is moved to finish cooking on the indirect heat side. The thickness of the roast and desired doneness will dictate the remaining cooking time. Once the roast reaches the desired temperature, remove from the grill and transfer to a cutting board, tent loosely with aluminum foil, and allow to rest for 10 minutes. Carve by slicing against or across the grain -- this is especially important to ensure a tender texture when serving the finished roast. Total time includes marinating or using a rub and resting time. Some tri-tip roasts are sold untrimmed which means there can be a fairly thick layer of fat on one side. If that is the case, trim this layer to a little less than 1/4" thick. If the tri-tip roast has been trimmed and little fat is present on the outside, drizzle with olive oil on each side during the cooking process to help keep the meat from drying out. For a special finish, top the Tri-Tip roast or steaks with herbed compound butter once removed from the grill. 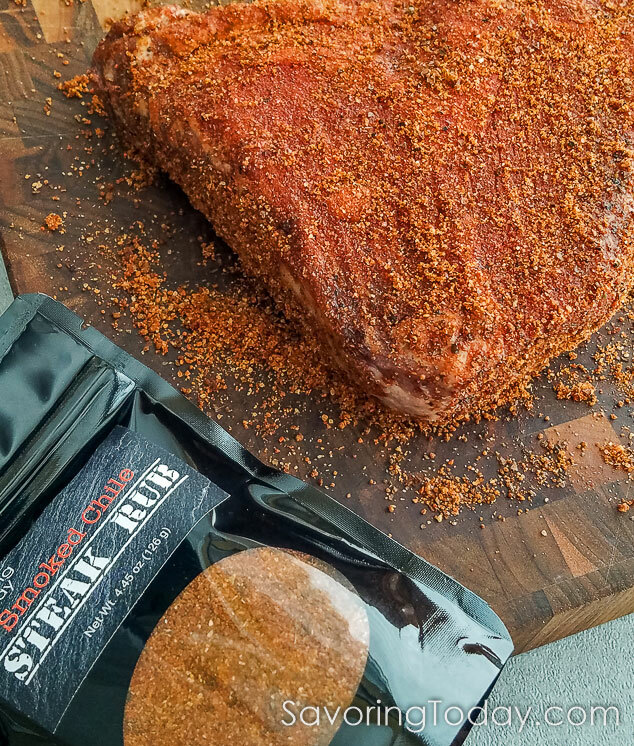 Try our very own Smoked Chile Steak Rub for steaks, tri-tip, burgers and more! 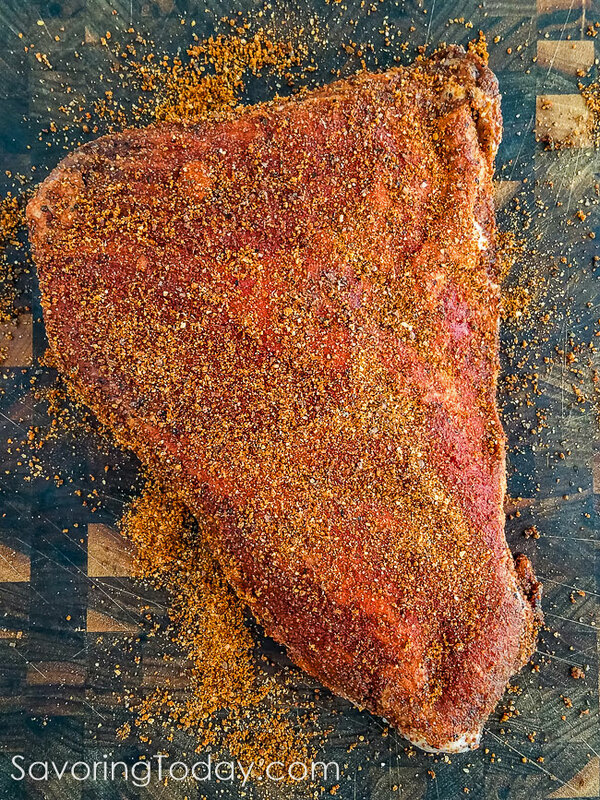 Our Smoked Chile Steak Rub provides deep flavor with a hint of smoky spice for beef, lamb or wild game. 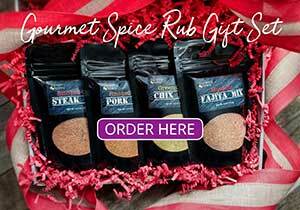 Created with the perfect steak in mind, we think you’ll make your best tasting steak yet with our rub. This seasoning is ideal for bringing a smoky flavor when cooking on a gas grill. Only whole ground spices, no extractives. Rich, smoky flavor comes from naturally smoked whole ingredients, not sprayed-on powders. No MSG, preservatives, or anti-caking agents, and ingredients are never hidden under “natural flavors”. Made with naturally smoked sea salt and coconut palm sugar, so it’s Paleo diet friendly. We love the flavor of tri-tip, but I usually smoke it in my little stove top smoker. Now I can’t wait to grill one! Yours looks awesome. This looks great! I just got my first grill and have been pinning a ton of great things to try out. This is definitely on my radar for dinner this week. Tri-tips are hard to find near me, but that cut of meat is so delicious! Also, interesting note about the location of the fat in connection to adding flavor, never knew that! 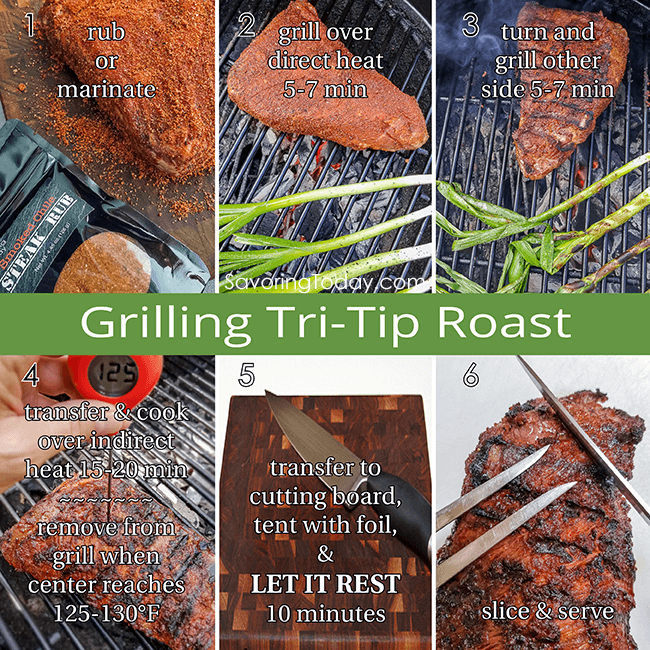 This is such an informative post, I learn so much about tri-tip from your post. I just got a grill for the first time (to use in my first patio!) and am looking for recipes that are more interesting than the burgers everyone made when I was a kid. This looks just lovely! I”ll have to keep an eye out for a tri tip. I just grilled a tri-tip last week, and I love them. Our local grocer had them on sale for under $3 per pound. I use a dry rub, bu I love your idea of a paste. That would definitely help the spices to cling to the meat better. You have an amazing flavor profile in your paste. I can’t wait to try this on my next tri tip. I love serving them with a salsa, but I will definitely have to try some of your finishing sauces. It’s so hot here, we’ve been grilling quite often. Your roast looks amazing! And thanks for all the tips! I have to admit I don’t cook a lot of meat because it intimidates me just a little. For some reason, I am not comfortable cooking anything that isn’t chicken or ground beef. I really need to broaden my horizons, because this looks awesome! What a gorgeous cut of meat! That rub is gorgeous, I can only imagine how delicious this must have been and how good it smelled grilling! This looks amazing! I’ve never cooked a tri-tip before, but it’s definitely on my list! What a great recipe to feed a crowd at a BBQ party. Looks so juicy….and I can already smell the aroma as this cooks on the grill. 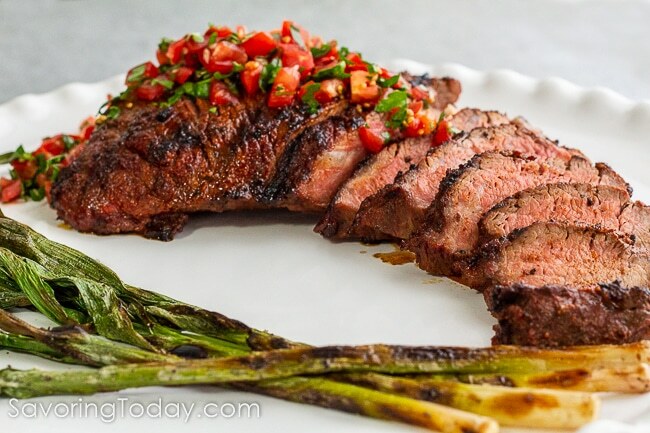 Sure love grilling season…and this beefy recipe. Glad you updated this — such an informative post. 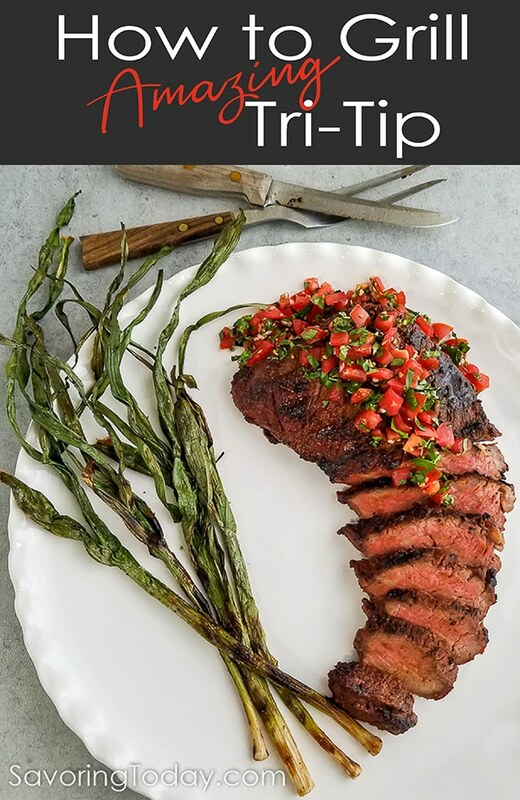 Tri-tip is such a versatile cut, and SO good. Good stuff — thanks. Thanks so much for your response. I an definitely going to try this. I subscribed so I get all your posts! Have you ever roasted this cut of meat? Or used a slow cooker? Would it cook like a pot roast or a roast beef? So glad to hear you have a grass-fed beef available to you, that is a great choice! Tri-tip is more tender than London broil because it has more marbling through the meat. In the winter when it is too cold to grill I do roast it in the oven at 350° for about 45 minutes for med-rare center, depending on the size. The texture when roasted is the same as when it is grilled — steak like — the flavor resembles roast beef. I have not put tri-tip in a slow cooker; it is not the type of cut that is fall-apart tender after extended cooking like chuck roast. It doesn’t have the kind of connective tissue of a chuck or pot roast requiring longer cooking times. I have heard that some folks put it in a pressure cooker, but I haven’t tried that. I think you will love it on the grill. Thanks so much for stopping-by Savoring Today. I hope to see you again :). Wow! This looks really good! I have seen Tri Tip available from my grassfed meat butcher and wondered about it. It look somewhat like a london broil. Is it more tender than a london broil? I plan to grill it and I really like the shape and being able to cook it med on the inside and more well on the outer sides. Thanks so much for sharing this! This looks delicious, and I like the lime you have used in the marinade – yum! I’m not sure what this cut would be called in England (I haven’t heard of Tri Tip Roast) but I’m going to show your post to my butcher and find out! Thank you so much for sharing this delicious recipe with the Hearth and Soul Blog Hop. I did a little research to see what I could find to help you. The tri-tip is also called “triangular” roast because of its shape. It is a triangular section of the sirloin primal and comes from the point where the sirloin meets the round and flank primals (tell your butcher this if he doesn’t know what a tri-tip is). Sometimes butchers will call the tri-tip “coulotte”, but that term should be reserved for the top sirloin cap. Here’s a couple more articles I found that might help you locate it in England. Tri-tip is our favorite beef cut also! I am going to try your recipe for a change…I have been marinating this cut for years with a so-called London Broil marinade of soy sauce, T-paste, garlic and herbs. We love it done on the rare side, and our kids always loved it. Thanks for a new idea for an old favorite. That looks great! Love lime juice on steak.